Yamaha’s Raptor 700 is the best-selling sport quad of its age, and for good reason. The four-wheeled powerhouse has a big-bore motor with a lot of torque, it handles well on all types of terrain and is comfortable to ride. This project Raptor started life as a fun racer in the hands of Russell Blake. It is a 2014 Special Edition model that was grey and black, but after a spill on the track and a lot of broken parts, the Yamaha is back and exceeding its former glory! We picked out parts that work well and are a good value. Some of them are spot-on in the cheaper end of things, but others are simply worth the extra cash. Yamaha’s Raptor 700 is a fuel-injected, single-cylinder four-stroke. It has a lot of power, but as a racer, Russell could use a bit more go. We installed a Barker’s slip-on exhaust system with yellow and blue accent parts. Barker’s designs a much freer-flowing exhaust pipe than stock that provides more power in conjunction with a fuel mapping system. The EHS system allows you to adjust where you want more fuel mixture to be added to pull out the ponies. Alba Racing beadlock wheels have Pit Bull Fang ATV tires mounted on them. The tires are a hard compound so they last longer on most terrain. A pipe and programmer only help you gain power if you let the motor breathe deeper. Fuel Customs makes intake systems that increase the airflow far more than a stock Raptor airbox could allow. The intake tube is bigger, the filter matches its size and the airbox comes without a lid. All of these power parts were quick and easy to install! Raptors are top-heavy sport quads. They have a tall engine, which means the gas tank has to sit up high too. All of these features relate to how the machine handles. It is a great trail quad.The front likes to dive in corners and can feel a bit unstable when you are trying to push its limits while racing though. Russell was ready to widen the quad’s track but without breaking the bank. We got together with Alba Racing and picked up its extended 2+ A-arm kit that works with stock-length shocks. Russ already had his stock shocks valved and tuned by Race Tech, but the extra leverage of the A-arms means they need to get tuned again so they aren’t too soft and ride just right for him. 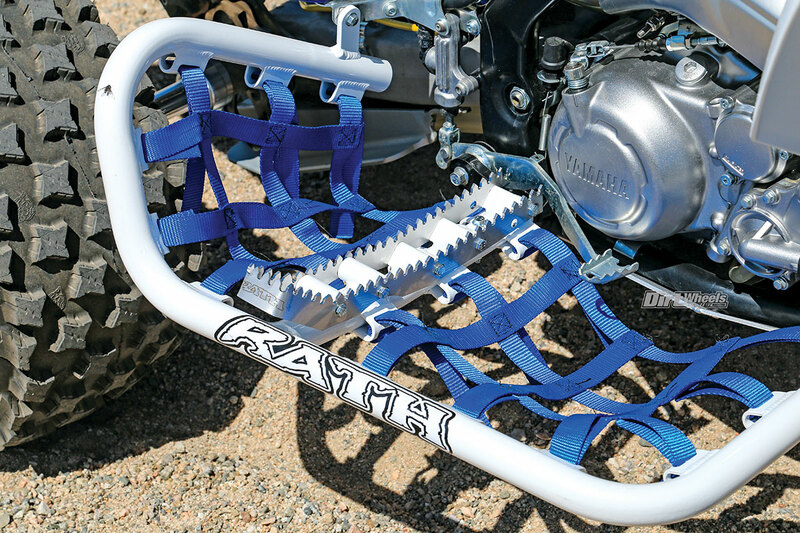 Ricochet Off-Road built the full-belly skid plate and a strong swingarm skid plate for the Yamaha. We widened the rear of the Raptor with a very strong and adjustable Durablue Eliminator axle that comes with a locking axle nut. 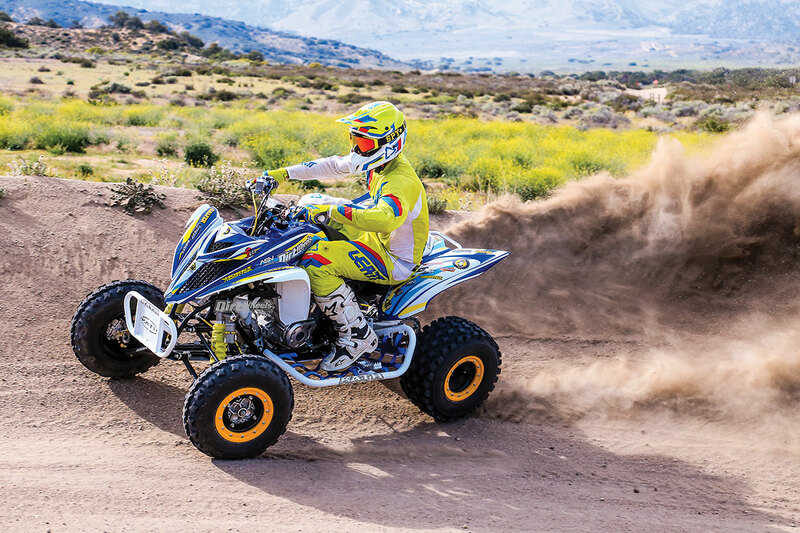 The confidence in cornering a wider ATV is helpful in racing, and the quad will simply handle the rough stuff much better now. Alba helped us reduce vibration to the rider with its anti-vibe +1 steering stem and bar clamp. 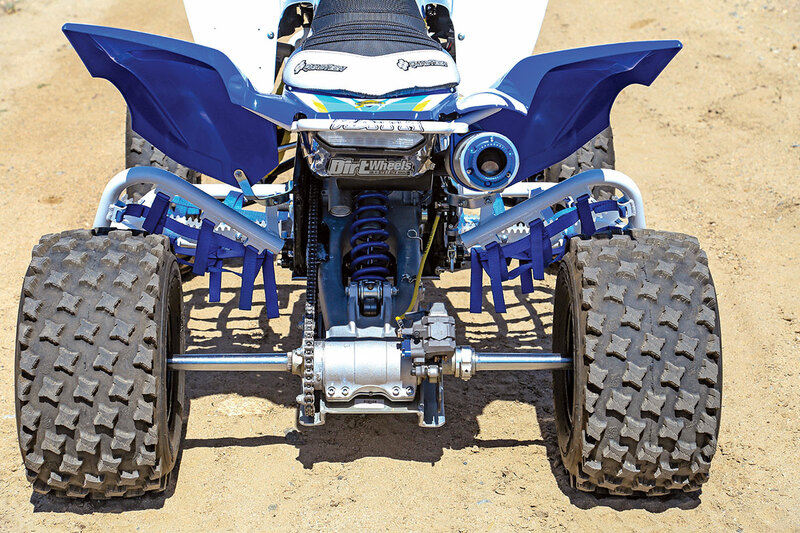 Attached to that is a Torc1 oversized bar and lock-on ATV grips that are both more comfortable for racing. 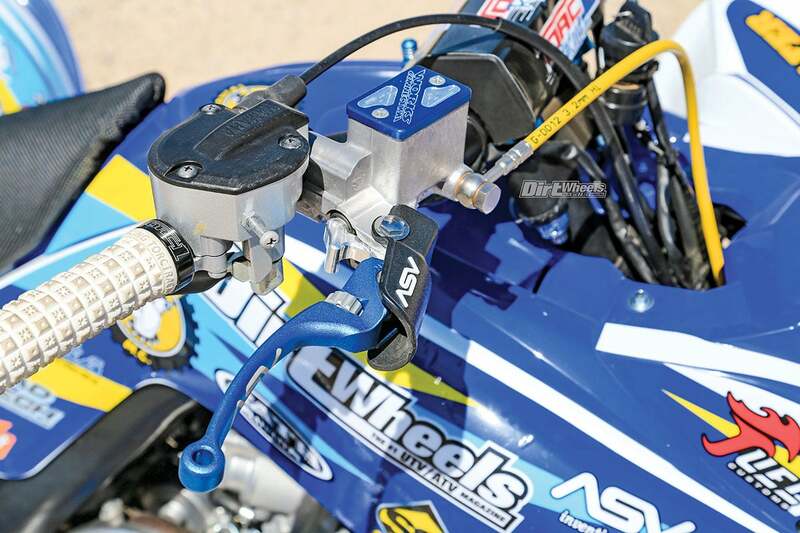 We hooked up with ASV Inventions for a set of adjustable F4 Series clutch and brake levers that include perches. If Russ takes another spill, these levers are far less likely to break because they are hinged to bend around, and they feel much better in your hands. A Pro Design kill switch, which is required for a lot of racing organizations, rounds out the handlebar accessories. The power add-ons from Barker’s Exhaust, EHS and Fuel Customs make throwing the Raptor 700 sideways a breeze. One part that is often overlooked is your seat. Most stock seats have little grip, so we got a seat cover and stock seat foam replacement from QuadTech. The cover has ribs built into the top and their super-grip system around the knee area. This helps you stay put while sitting down and lets you grip well standing up. Rath Racing got this project dialed in with their race-ready front bumper, rear grab bar and, most important, their Signature Series Pro Peg nerf bars with their Monster pegs. The Monster pegs are super wide and reach the end of the nerfs. The teeth on the pegs are tall and sharp as well, so foot traction is abundant. Durablue’s Eliminator axle can be adjusted width-wise. Galfer USA provided sintered brake pads, wave rotors and colored brake lines. Next, we gained a new braking setup from Galfer USA. They provided the longer brake lines we needed for the wider front suspension and color-matched them yellow. Galfer suggested sintered brake pads and wave rotors in the front and rear for much stronger and smoother braking. When we got Russell’s quad, it was beat up. The radiator had to be replaced with an OEM one from Yamaha, so we figured it was a solid idea to run Twin Air’s new IceFlow coolant in the radiator to let the engine retain its power when it gets hot. 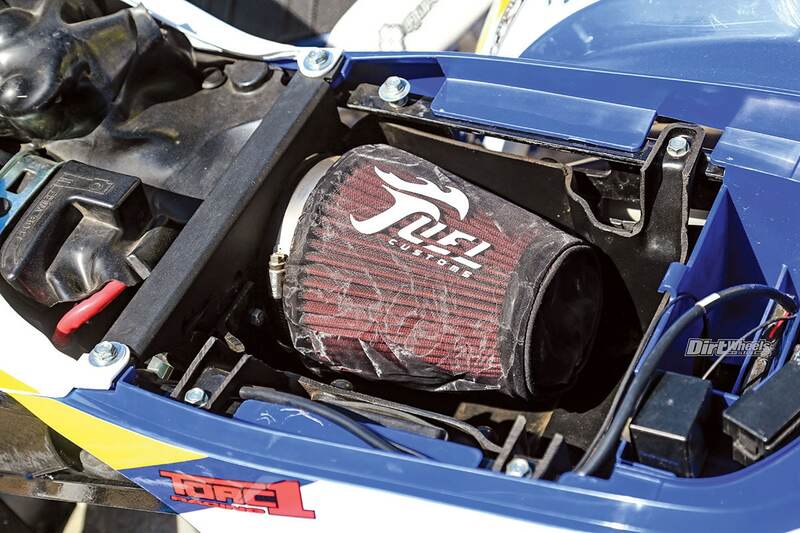 A Fuel Customs intake breathes much easier with their lid-less airbox and bigger intake tube and filter. The plastics are all new from the manufacturer, and we chose to go with white and blue to brighten things up and stay true to Yamaha. 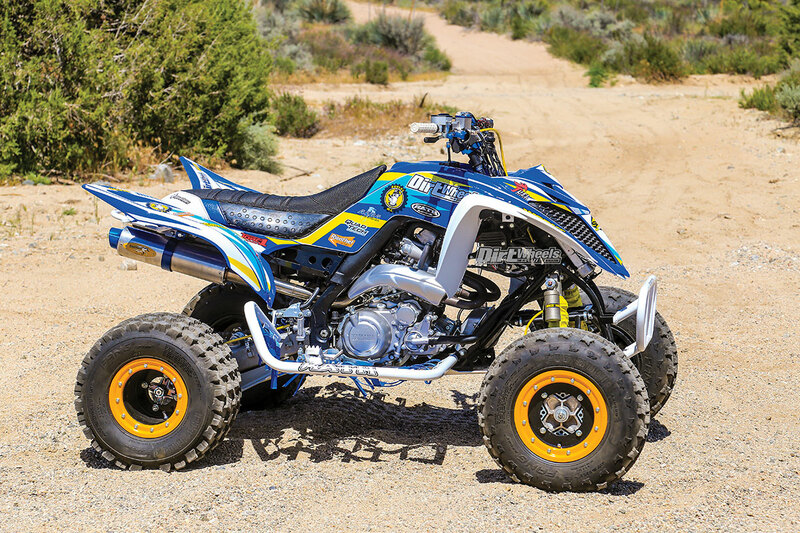 SSi Decals designed a radical graphics kit with white, blue and yellow involved. Russell rides for the Rovers Motorcycle Club, so we added in the yellow to match their logo. We added to the flair of the quad through Works Connection colored engine plugs, an e-brake delete plate and a front-brake reservoir cap. An hour meter was installed on the Raptor as well. Blake’s subframe was destroyed in the crash, so he had a custom one built up. His skid plates had taken years of abuse in desert and motocross races, so we got a heavy-duty swingarm skid and belly skid plate from Ricochet Off-Road. 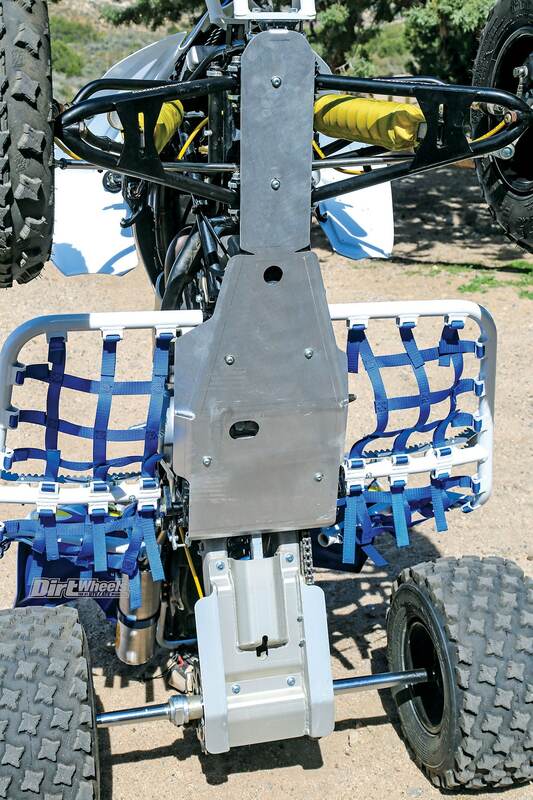 We have had great luck with their ATV and UTV skid plates over the years. Race Tech had originally put new springs on these stock shocks, but now they need a re-valve for the added leverage of the +2-inch Alba A-arms. When we set out to perform upgrades on a machine, we like to choose parts that will make it work better. Sometimes you also have to make your ride look cool, so Russell and our crew made sure of that. The suspension additions helped the Raptor ride smoother and take corners and off-camber sections with a lot more stability. The Galfer brake upgrades were immediately noticeable. They stopped the quad faster and didn’t fade as quickly with heat. 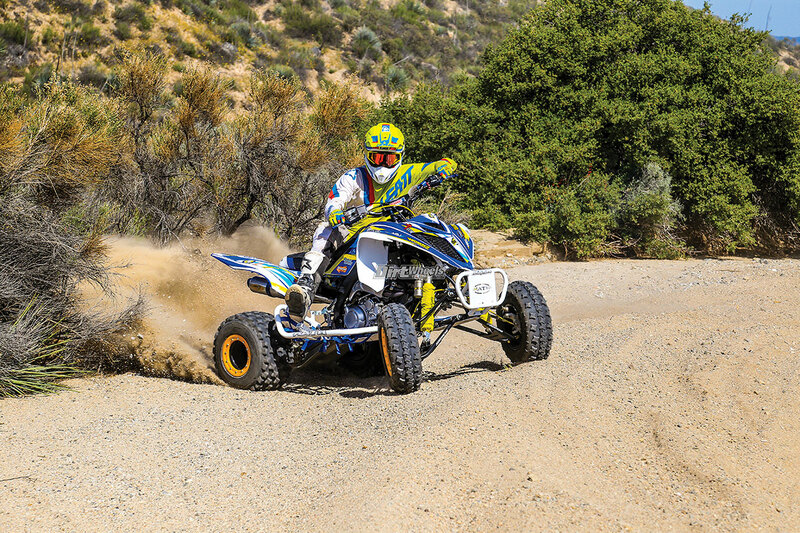 The ASV levers, and Torc1 handlebar setup gave the quad a more aggressive feel with less sweep than the stock bar. ASV levers and perches, Torc1 grips and bar, Galfer brake lines and a Works Connection brake reservoir cap can be seen here. 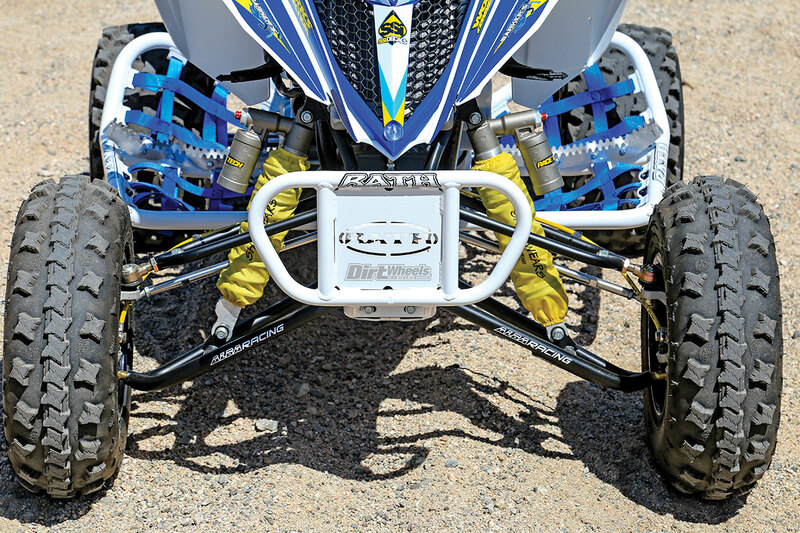 The QuadTech seat cover was one of our favorite upgrades, right in line with the Rath Racing nerf bars. It’s crucial to be able to hang onto your quad while riding the rough, and you use your whole body to do so. The power upgrades from Barker’s and Fuel Customs provided more low-end power that pulled strong through the rest of the range. The map that comes on the EHS tuner is set up pretty well, but we made a few adjustments as we tested the Raptor 700. Finally, the Pit Bull Fang tires wrapped around Alba Racing bead-lock wheels provided good traction everywhere we went. Russell Blake is stoked to hop on his remodeled ride and show it off at the track! It looks rad, thanks to fresh Yamaha plastics and SSi decals, and it handles just as well as it looks. Rath Racing’s Signature Series nerf bars with their Monster pegs provide a ton of room and foot traction.